« Don’t fight ’em, join ’em! On dark days I ask myself whether the Jewish people and its state — which sustains and protects it — will survive. On really dark days I ask whether we are the primary agents of our own destruction. Here are just a few random examples that I’ve come across recently. We collected over 20,000 signatures in 24 hours asking Iran Unity rally organizer Malcolm Hoenlein to take Sarah Palin off the schedule for Monday’s rally, and he caved to our pressure on Thursday afternoon citing the fact that the rally had become too partisan. This is an issue that should unite all Americans. Iran should not be allowed to acquire nuclear weapons. Period. And in a single voice, we must be loud enough for the whole world to hear: Stop Iran! Why did some American Jews prefer that this message not be heard? Example no. 2: Some Orthodox Jews believe that only God may create a Jewish State. Most of them, however, do not embrace Israel’s enemies. But Neturei Karta does. Neturei Karta is a highly visible presence at anti-Israel demonstrations, and even sent a delegation to Ahmadinejad’s Holocaust denial conference. They have received funding from Iran and, in 2002, from Yasser Arafat. The B’Tselem staffers intend to inform the policy makers, American public and the American Jewish community about human rights conditions in the Palestinian territories. B’Tselem is a ‘human rights’ organization that is interested only in the human rights of Palestinians, not Israelis. Even given this, its reports are highly distorted and biased against Israel (read CAMERA’s report on B’Tselem here). B’Tselem’s funding comes from various sources — mostly European, but including the New Israel Fund, which I have previously discussed (see: A Jewish Charity that Helps Delegitimize Israel). What makes these groups particularly effective of course is that they are comprised of Jews. Neturei Karta’s condemnations of Zionism as a form of anti-Semitism appear alongside quotations from Hitler on neo-Nazi websites, while Palestinians point to B’Tselem — after all, an Israeli organization — as proof of their brutal treatment at the hands of the Zionists. These Jewish groups — and all the others, like Brit Tzedek v’Shalom, Jewish Voice for Peace, etc. — have different points of view. 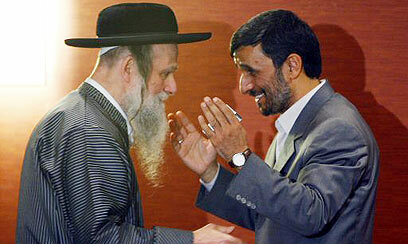 But although they will talk for as long as you will listen about their ideologies, and although we can speculate forever about their psychological motivations, the fact is that their actions abet those, like Ahmadinejad and Hamas, who simply want to murder Jews. They are Jews against the Jewish people. This entry was posted on Thursday, September 25th, 2008 at 7:52 pm and is filed under General. You can follow any responses to this entry through the RSS 2.0 feed. Both comments and pings are currently closed. Contempt and incredible anger are the emotions aroused by these anti- Jewish Jews. They are working to empower Israel’s enemies at a very critical moment when Iran is on the verge of nuclear capability, and Israel is now ‘covered’ by missiles from Syria, Hamas, Hizbollah- not to speak of Iran. These groups especially those on the Left would most likely have more weight in an Obama Presidency. And there is the danger that the U.S. at its hour of weakness will buy the argument that selling out Israel will win its points in its overall strategic position.